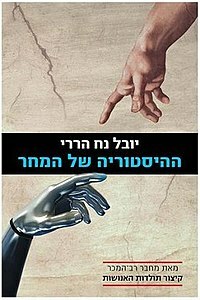 Homo Deus: A Brief History of Tomorrow (Hebrew: ההיסטוריה של המחר) is a book written by Israeli author Yuval Noah Harari, professor at the Hebrew University in Jerusalem. The book was first published in Hebrew in 2015 by Dvir publishing; the English-language version was published in September 2016 in the United Kingdom and in February 2017 in the United States. As with its predecessor, Sapiens: A Brief History of Humankind, Harari recounts the course of history while describing events and the individual human experience, along with ethical issues in relation to his historical survey. However, Homo Deus deals more with the abilities acquired by humans (Homo sapiens) throughout their existence, and their evolution as the dominant species in the world. The book describes mankind's current abilities and achievements and attempts to paint an image of the future. Many philosophical issues are discussed, such as the human experience, individualism, human emotion, and consciousness. The first part of the book explores the relationship between humans and other animals, exploring what led to the former's dominance. Since the verbal/language revolution some 70,000 years ago, humans live within an "intersubjective reality", such as countries, borders, religion, money and companies, all created to enable large-scale, flexible cooperation between different individual human beings. Humanity is separated from animals by humans' ability to believe in these intersubjective constructs that exist only in the human mind and are given force through collective belief. Humankind's immense ability to give meaning to its actions and thoughts is what has enabled its many achievements. Harari argues that humanism is a form of religion that worships humankind instead of a god. It puts humankind and its desires as a top priority in the world, in which humans themselves are framed as the dominant beings. Humanists believe that ethics and values are derived internally within each individual, rather than from an external source. During the 21st century, Harari believes that humanism may push humans to search for immortality, happiness, and power. Technological developments have threatened the continued ability of humans to give meaning to their lives; Harari suggests the possilibity of the replacement of humankind with the super-man, or "homo deus" (human god) endowed with abilities such as eternal life. The last chapter suggests the possibility that humans are algorithms, and as such Homo sapiens may not be dominant in a universe where big data becomes a paradigm. Time magazine listed Homo Deus as one of its top ten non-fiction books of 2017. Wellcome longlisted Homo Deus for their 2017 Book Prize. After its publication, Homo Deus received significant media attention:[original research?] The New York Times, The Guardian, The Economist, The New Yorker, NPR, Financial Times, and Times Higher Education published articles and reviews about the book. The review aggregator website Book Marks reported that 43% of critics gave the book a "rave" review, whilst the rest of the critics expressed either "positive" (29%) or "mixed" (29%) impressions, based on a sample of seven reviews. Writing in The Guardian, David Runciman praised the book's originality and style, although suggested it lacked empathy for Homo sapiens. The review points out that "Harari cares about the fate of animals in a human world but he writes about the prospects for Homo sapiens in a data-driven world with a lofty insouciance." Runciman nonetheless gave the book a generally positive review. Writing in the Journal of Evolution and Technology, Allan McCay has challenged Harari's claims about human algorithmic agency. ^ Harari, Yuval Noah (2017). Homo Deus: A Brief History of Tomorrow. London: Vintage. pp. 75–76. ISBN 9781784703936. OCLC 953597984. ^ Harari, Yuval Noah (2016). Homo Deus: A Brief History of Tomorrow. Random House. p. 462. ^ Howorth, Claire (21 November 2017). "The Top 10 Non-Fiction Books of 2017". Time. Retrieved 13 December 2017. ^ "Homo Deus | Wellcome Book Prize". wellcomebookprize.org. Retrieved 11 March 2018. ^ Senior, Jennifer (15 February 2017). "Review: 'Homo Deus' Foresees a Godlike Future. (Ignore the Techno-Overlords.)". The New York Times. ISSN 0362-4331. Retrieved 5 April 2017. ^ Mukherjee, Siddhartha (13 March 2017). "The Future of Humans? One Forecaster Calls for Obsolescence". The New York Times. ISSN 0362-4331. Retrieved 5 April 2017. ^ Adams, Tim (11 September 2016). "Homo Deus: A Brief History of Tomorrow by Yuval Noah Harari review – chilling". The Guardian. ISSN 0261-3077. Retrieved 5 April 2017. ^ a b Runciman, David (24 August 2016). "Homo Deus by Yuval Noah Harari review – how data will destroy human freedom". The Guardian. ISSN 0261-3077. Retrieved 5 April 2017. ^ "Future shock". The Economist. Retrieved 5 April 2017. ^ "Are Liberals on the Wrong Side of History?". The New Yorker. Retrieved 5 April 2017. ^ "Are Cyborgs in Our Future? 'Homo Deus' Author Thinks So". NPR.org. Retrieved 5 April 2017. ^ "Planet of the apps – have we paved the way for our own extinction?". www.ft.com. Retrieved 5 April 2017. ^ "Homo Deus: A Brief History of Tomorrow, by Yuval Noah Harari". Times Higher Education (THE). 13 October 2016. Retrieved 5 April 2017. ^ "Homo Deus: A Brief History of Tomorrow". Book Marks. Retrieved 28 December 2018. ^ "The Value of Consciousness and Free Will in a Technological Dystopia". jetpress.org. Retrieved 25 September 2018. Book review of Homo Deus: A Brief History of Tomorrow. In Med Health Care and Philos (2018). Retrieved 16 August 2018. This page was last edited on 10 April 2019, at 10:14 (UTC).